If you’re building a new patio, fire pit, or other outdoor structure or just looking to add sitting space to an existing hardscape design, a seating wall can be the perfect finishing touch. At O’Grady’s Landscape, we specialize in stone seating wall design and construction to create beautiful, long-lasting products for clients throughout Northern Virginia. 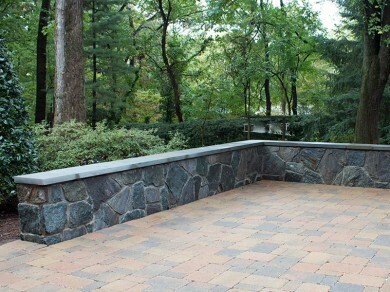 To see what our landscape designers can do for you, call today and ask about our seating wall service at 703-533-5001! Location: Are you building a patio seating wall as part of new patio construction? Or including one as part of a new fire pit design? We consider the size, material, and design of any other structures to properly integrate the seating wall into the hardscape design. Material: Stone seating walls can be built with a wide range of materials, including paver stone, Bluestone, cultured stone, flagstone, etc. We consider the choice of materials in complementary hardscapes and your requirements for style and price to make the best decision. Size: We will discuss with you how many people may be sitting on the wall, as well as the size of your overall landscape design and any other hardscapes involved in the design—from major elements like patios to complementary structures like columns. Whether you want additional seating space to entertain guests or you’re looking for the final details to complete the look of your landscape design, O’Grady’s Landscape can help. For examples of our work, visit our design gallery, where you’ll find photos of seating walls and more. Whatever your needs may be for a seating wall in Northern Virginia, we’ll work with you to create something entirely unique. Our landscapers have years of experience creating beautiful yet functional hardscape designs of all types, with stone seating walls being just one of our many specialties. We can also help you create a patio, fire pit, or other type of structure from the ground up, with a seating wall included in the final design. Enjoy additional sitting space and enhance the look of your landscape design with a seating wall in Great Falls, the City of Falls Church, McLean, Vienna, or North Arlington. Call O’Grady’s Landscape to schedule a consultation today at 703-533-5001!